It is believed that coffee was discovered in Ethiopia already in the ninth century. According to botanical evidence, coffee Arabica is originated in central Ethiopia. Of many reasons Ethiopia is considered to be the birthplace of coffee culture. Today, Ethiopia is one of the world's largest coffee producers and some of the most famous coffee regions are found there. A lot of coffee is also consumed in Ethiopia - the country leads the continent in domestic consumption. Coffee remains central to Ethiopian culture and heritage and is shared with family and friends through coffee ceremonies lasting up to several hours. On New Year’s Eve I got to taste original Ethiopian coffee prepared in an Ethiopian coffee ceremony. This was a special experience and truly something else than a regular cup of coffee. And guess what – I did not travel far for this unique coffee experience – the Ethiopian coffee ceremony was served in Helsinki here in Finland. About a month ago I discovered that an Ethiopian restaurant Queen Sheba located in central Helsinki offers the Ethiopian coffee ceremony. I must say this was one piece of exiting coffee news. I am very happy to see that alternatives in Helsinki’s coffee scene are becoming more and more versatile and being able to experience the Ethiopian coffee ceremony is like the cherry on the cake. In the Ethiopian coffee ceremony multiple steps include pan-roasting coffee beans, grinding the roasted beans, and preparing the coffee in a traditional black coffee pot called jebena. Jebena is usually made of pottery and has a spherical base, a neck and pouring spout and a handle in which the neck connects with the base. When the coffee boils up through the neck it is poured in and out with another container and then is put back into the jebena. To pour the coffee from the jebena a filter is placed in the spout of the jebena to prevent the grounds from escaping. The coffee is served in traditional Ethiopian tasting cups. Ethiopian lady roasting coffee beans on a pan and giving the restaurant a nice roasted aroma and some smoke as well. The national dish of Ethiopia Doro Wot chicken stew and injera crepes among other dishes were served at Queen Sheba in buffet style. Coffee prepared in the ceremony was served after the main course to finish the dinner. 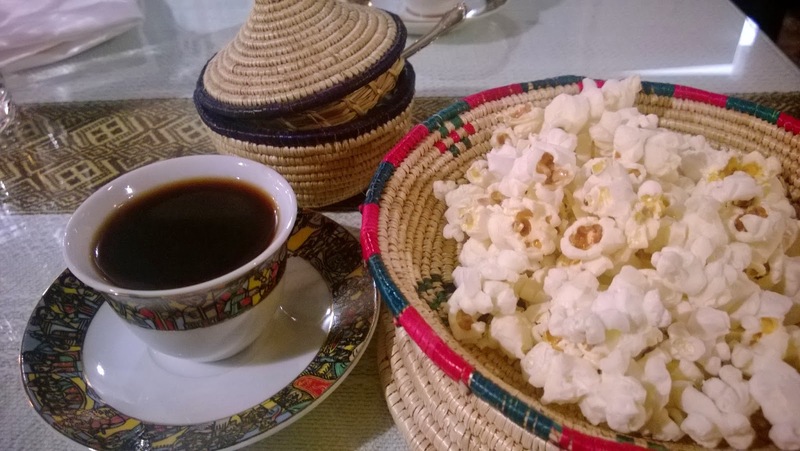 Snacks of roasted peanuts, popcorn or chickpeas accompany the Ethiopian coffee. This time coffee was served with popcorn and what a great match it was! Coffee and popcorn is a combo I normally favour when going to the movies but this is definitely something I will be having more often at home as well. For me the Ethiopian coffee ceremony was a magical, almost spiritual, experience. First of all watching the lady to prepare everything in the ceremony, sensing the aroma of roasted beans and smoke in the restaurant, discovering Ethiopian art painted in the beautiful coffee cups, and finally tasting the full flavours of the coffee. The coffee tasted strong and rich but at the same time very balanced. I enjoyed very much the entire experience and learning more about the Ethiopian coffee culture. It is fantastic to see how many ways coffee is enjoyed and cherished. The Queen Sheba is a small and cosy restaurant and the personnel create a friendly atmosphere. They offer Ethiopian food and coffee. The Ethiopian coffee ceremony is regularly available during lunch time on weekdays. Awesome ethiopia coffee post. I Like your queensheba ethiopian restaurant post. Thank you for your nice comment! I was so happy when I discovered that the restaurant offers Ethiopian coffee ceremony here in Helsinki and I got the chance to try it. A fantastic experience for a coffee enthusiast!